On occasion we'll have an after-dinner dessert... though it's usually while dining out... and most often one where four or more spoons have cleaned the plate. Unless I'm baking for a special reason, have family or guests staying with us, or know I can "gift" three quarters of a batch of cookies, I don't make a lot of sweets. And, other than a few trusted bars of dark chocolate that can always be found in our fridge, we don't have any boxed cookies or candies stashed away in our pantry. What we do always seem to have this time of year, and especially through the summer, are berries. So when the urge for something sweet hits, it's usually this old standby that we turn to. My childhood version of this treat (and one that I continued well into our first years of marriage) was simply ripe berries dolloped with some sour cream and dusted with granulated sugar. No measuring. No prep bowls. We ate it in the same bowl it was mixed in... and ate it with the same spoon that did the mixing. A few good turns, a taste, and adjustments were made... more sour cream, sugar, or both. By the time you finished mixing it all up the whole concoction would be run through with the vibrant, sweet juice of the cut berries... and light pink in hue. I think I loved that color as much as I loved the treat. 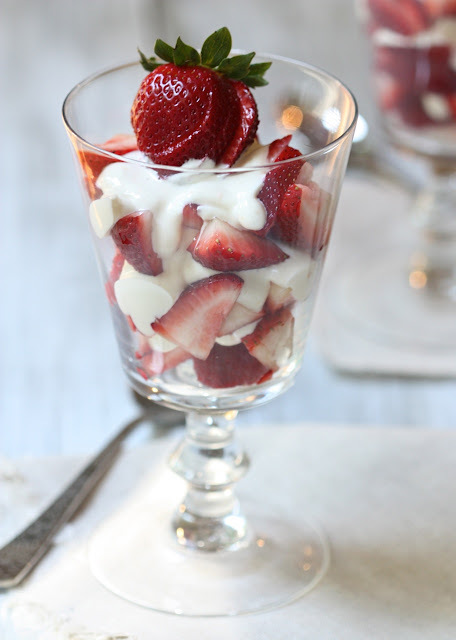 Over the years, as I came to appreciate the beauty of berries as much as their flavor, the cream matured to a topping... and whether due to nostalgia or not, efforts to replace the sour cream with yogurt or mascarpone, though good, just aren't the same. Today, it's still a simple mix of sour cream and sugar... though now with a bit of vanilla extract and orange zest added in. It still gets the same good turns of a spoon, until smooth and creamy in consistency. It still gets tasted and adjusted, as necessary. And it's still enjoyed as much as it was years ago... only now it's dolloped over or in between the berries... and not through to a hue. Mix sour cream and sugar in a small bowl, until consistency is very smooth and creamy. Add in vanilla and zest; mix well. Taste and adjust sweetness to your preference. 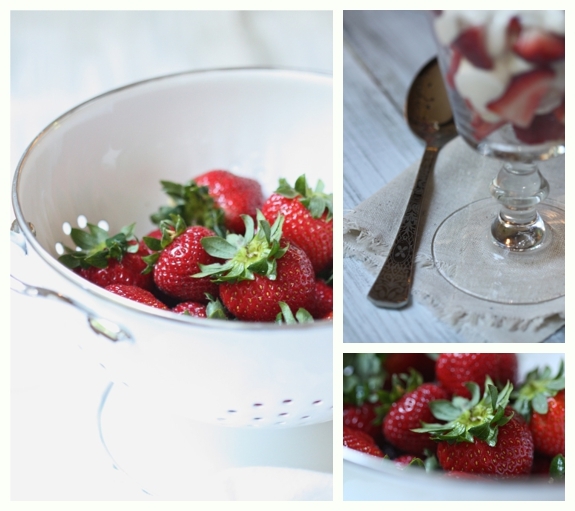 Spoon a little (or a lot) over fresh berries and serve.